If you are a Jordanian king, you are a Star Trek fan, and you have some money to throw away spare, what would you do? (The answer is so obvious that I shake my head even as I ask the question in writing.) Build a Star Trek theme park, what else? Fifteen years after being immortalized in a Star Trek episode – no matter how short the scene was – the king of Jordan might just be part of another momentous endeavor. A venue called Red Sea Astrarium is being planned in Aqaba, Jordan’s single port. 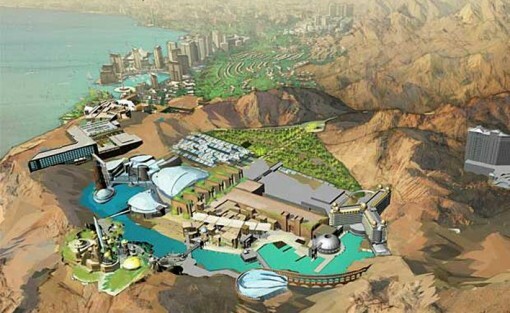 This astrarium is planned to cover 184 acres (74.4 hectares) and will revolve around “ancient history with Nabatean, Babylonian, British and Roman influences.” And of course, a Star Trek theme park is also part of the plans. Rubicon Group Holding is the entity tasked with planning and developing the project. So what can be expected from a Star Trek-themed park? Think space-flight experiences. Think sci-fi turning into reality. They even claim that the technology to be used in the Star Trek theme park is nothing less than multi-sensory 23rd century level! Here’s another bit of trivia that will excite theme park and Star Trek fans: once up and running, this park will be the only one with Star Trek features in the world. Apparently, there used to be one in Las Vegas, but it has already shut down. The park is planned to be operational by the year 2014. Yes, it is such a long way off, but something of this scale and proportion is bound to take a while to complete. In the meantime, we can only wait and hope that the result will not fail to please. One thing I am sure of, Scotty himself would be pleased with the idea!